Kristen returned to Furnace Brook Physical Therapy in 2006 after serving a clinical affiliation in 2003. She received her Doctorate of Physical Therapy at MGH Institute of Health Professions in 2005. Following graduation, she served a year-long internship at Children’s Hospital Boston. As a result of this experience, she has developed a clinical interest in high school athletes and pediatrics. Being an avid softball and soccer athlete, she also has a keen interest in all aspects of sports-related injuries and rehabilitation, particularly knee reconstructions. Kristen is certified in Manual Lymphatic Drainage (MLD) and Complete Decongestive Therapy (CDT) following 145 classroom hours from Klose Training and Consulting in 2008. She co-directs the Lymphadema program at the clinic with Samantha Alosco. Kristen became a Certified Strength and Conditioning Specialist in 2010. She is a member of the American Physical Therapy Association, and is a certified lifeguard by the American Red Cross. 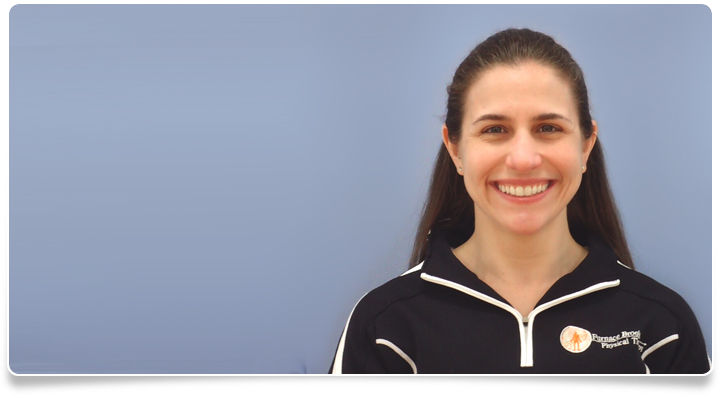 Prior to starting her family, Kristen served as the Clinic Manager of Furnace Brook PT.